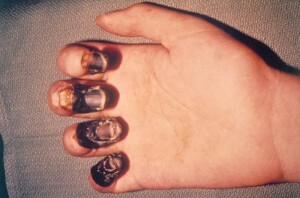 Infection of plague is caused due to bacterium Yersinia pestis. This bacterium is found in fleas and rats. Animals and humans suffer with plague from flea bites and rats. Plague has destroyed many civilizations. Plague is uncommon today. It is all because of better living standards and antibiotics. There are three different types of plague. Bubonic plague: This type of plague causes adenoids, thymus, tonsils and spleen to be inflamed. The symptoms of plague here include tender lymph glands, chills, fever and aches. Septicemic plague: In this type of plague bacteria in the blood multiplies and causes bleeding under organs and skin, shock, fever and chills. Pneumonic plague: Here the bacteria enter in our lungs where it causes pneumonia. People having infection spread the pneumonic plague to others. Therefore, this type of plague is considered to be a bioterror agent. Strong antibiotics are used for the treatment of plague as no vaccines are available for plague.